Mauricio Pochettino has insisted winning trophies only serves to build ego and does not believe securing one will automatically take Tottenham to the next level. Spurs lost the Carabao Cup semi-final to Chelsea on penalties on Thursday night and then followed that up with a 2-0 defeat at Crystal Palace in the FA Cup fourth round. A shocking first-half display from a much-changed side saw them go behind to Connor Wickham's opener and an Andros Townsend penalty, while Kieran Trippier missed from the spot for the visitors. The back-to-back losses will give Spurs' detractors more ammunition, but the Argentine is not losing focus on Spurs' main aim and does not agree a trophy will automatically take them to the next level. "Again we're going to have the debate whether a trophy will take the club to the next level. I don't agree with it. It only builds your ego. The most important thing for Tottenham right now is to always be in the top four." He added: "It's true, this season has been tough. I told you it would be a massive challenge for us, but we believe it'll be a tough season but no tougher than it's been. "Of course, disappointed because, after Thursday and today again, out of two competitions. You feel disappointed. You can't feel anything different. "But now we have to be positive. We are still in two competitions, in a good position in the Premier League and the Champions League is a massive motivation for the whole club. We have to be strong. "People wish we could win some trophies. But being realistic, we are doing so well. To win a title here in England like the FA Cup or Carabao Cup is about being lucky, not only about quality in your squad. "To arrive here in different condition, so you can fight or be stronger… Of course, it's tougher to compete and win when things happened as they did. "Sometimes when you assess football, you only look at which team won and which team lost, but you have to consider all the circumstances. "Now the realistic targets are trying to be in the top four, try and be close to Manchester City and Liverpool and reduce the gap. "To be a contender is always difficult for us. [Top four] is realistic. Another is to try and beat [Borussia] Dortmund and be in the next round. That is tough." 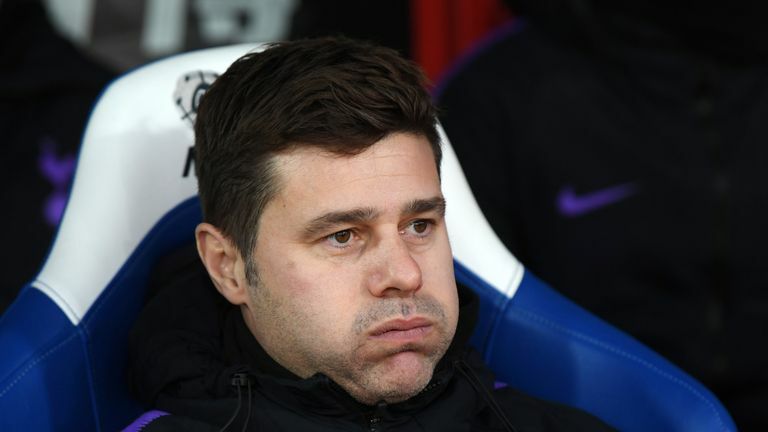 Given their quick turnaround from Thursday night, Pochettino made seven changes, which included Christian Eriksen not even featuring on the bench. But the Spurs boss stuck by his selection. "Regrets? No, no," he added. "We played with our best team that we can play at the moment. I think it was a moment, of course, for different players to play. To help the team. "I think we came from a very crazy fixture and were forced to take some decisions, rest some players and rotate. But we are going to play Wednesday too and Saturday."